Have you ever wondered how the Power BI data region is selected? In this video, I look at how the Power BI data region is selected. This is the what you see when you go to About Power BI and see “Your data is stored in”. To find the data region you are currently in, you can go to the ? 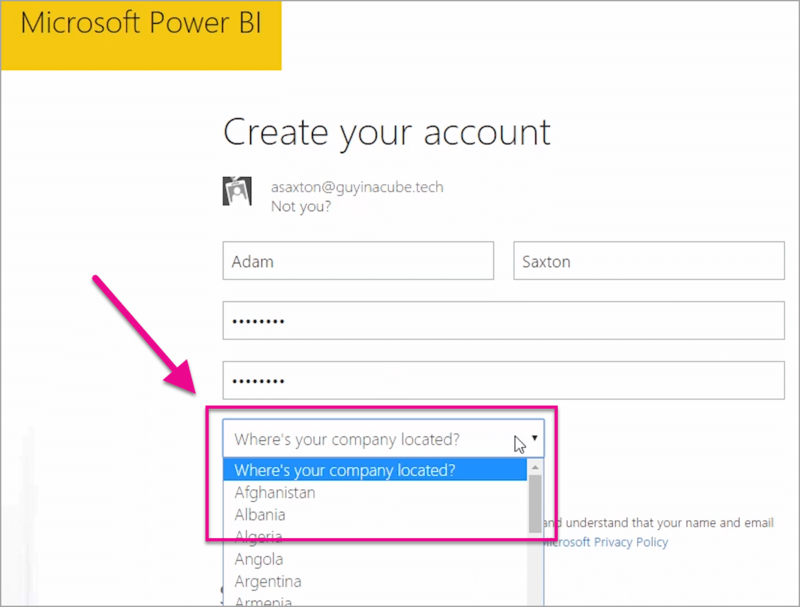 within the Power BI Service and select About Power BI. This will show Your data is stored in. The location is the data region your data is in. The data region is based on the country that was selected when the tenant was first created. This applies to sign up for Office 365 in addition to Power BI as this information is shared. If this is a new tenant, when you sign up, you will see a country drop down. This selection is what drives the location of where your data will be stored. Power BI will pick a data region closest to this selection. This selection CANNOT BE CHANGED! You will want to think about the location that makes the most sense for you. For example, if the majority of your organization’s users are in Australia, and you are in the United States, it probably makes more sense to select Australia for the country. You may also have legal requirements that your organization’s data needs to be in a specific country.